Reporter's Notebook: Behind The Scenes Before The Super Bowl NPR's Tom Goldman was in Houston leading up to the Super Bowl. He talked to a player who isn't normally in the spotlight, noted a lack of information, and talked to a mother pushing for sports safety. 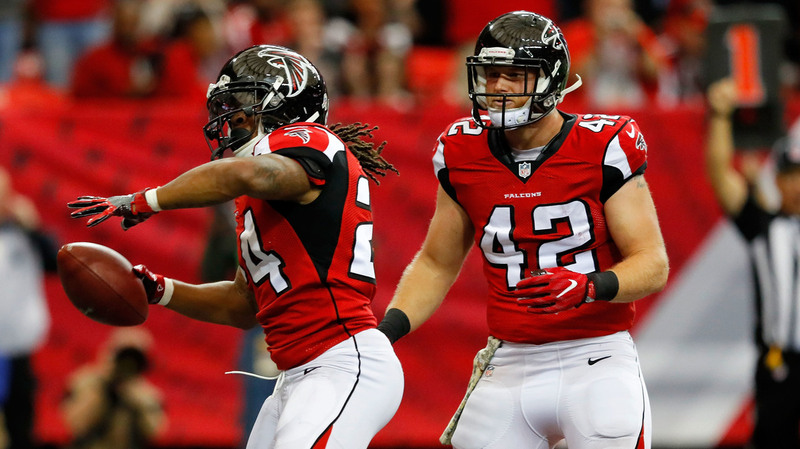 #24 Devonta Freeman celebrates a touchdown with Patrick DiMarco #42 on Nov. 27, 2016 in Atlanta, Georgia. DiMarco is OK with having a backing role on the team. Finally, today, they will play football. The Atlanta Falcons take on the New England Patriots in Super Bowl 51. After an NFL season of sagging TV ratings, it's expected today's game, in Houston, will do what Super Bowls always do — turn 60 minutes of football into a national holiday. Everything about the Super Bowl is supersized: from the money it generates to the buildup in the host city. Super Bowl week is a kaleidoscope of massive crowds, celebrity sightings and huge events. But for journalists, it can also be a collection of small, incongruous moments — that somehow fit together. There's the nuclear code. There are state secrets. And then there's the Super Bowl game plan. Of the three, the game plan may be the most difficult to penetrate. Especially when dealing with New England head coach Bill Belichick. Normally tight-lipped with the sports media, Belichick's lips reach maximum tension when the Super Bowl rolls around ... and this is his record seventh appearance.
" 'Everybody's got a job to do,' Belichick said. 'Nobody can do anybody else's job. We all have to do what we each have to do.' 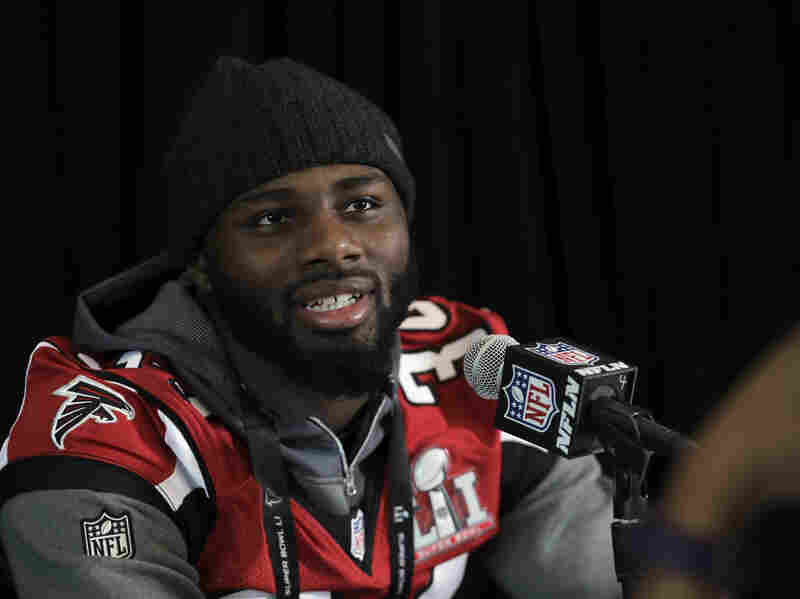 "
During a media availability with the Falcons, in their first Super Bowl since 1999 and only their second ever, I figured the newbies might go where Belichick wouldn't. I chose my prey carefully, singling out defensive back Brian Poole, a mere child at 24. "This is the last [media availability] before the game on Sunday," I said. "I'm going to give you a chance to reveal your strategy for stopping Tom Brady." "I can't give you the strategy," Poole answered. 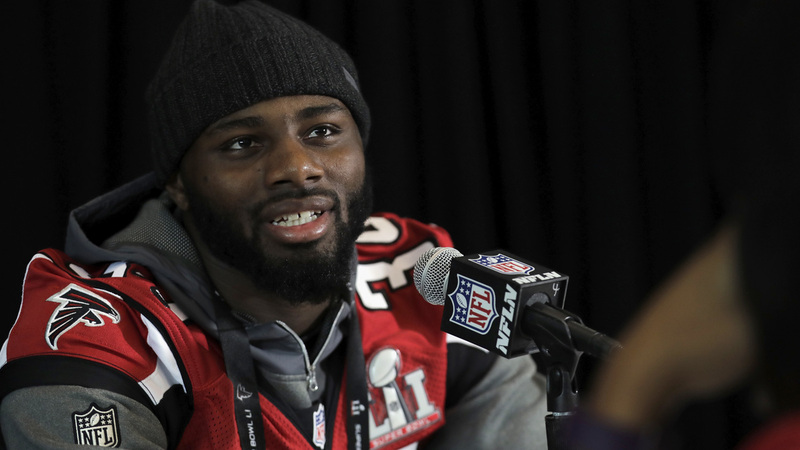 Brian Poole of the Atlanta Falcons talked to the media this past week, but wasn't too revealing about game plans. "No, I can't do that." I tried an end run. "OK, can you tell me, in general, what you do against a guy like Brady? We're talking about probably the greatest quarterback ever." "You just stick to doing what you do," Poole said. "Don't try to do too much. Stick to the plan. Focus on you. Your team, your game plan. Just execute." "Uh Brian? That's very vague," I said. "You didn't give me any details." Good for Brian Poole. He did his job. I, like everyone else, will figure out the game plans, during the game. At least Brian Poole wasn't sitting at a table. When teams meet the media, as the Falcons did at the Memorial City Mall ice arena, there's a hierarchy. Usually the head coach and quarterback or another star player hold a short press conference. About 10 other top players appear on risers — Poole was on one — and most of them attract a pack of reporters. The rest of the players are at tables. And a lot of them spend the time, nearly an hour, on their phones, reading newspapers, chatting with each other. The fact that no one's interviewing them doesn't reflect a lack of importance to the team. But in the star-driven NFL, a punter doesn't rate with a wide receiver. And a table ain't a riser. Patrick DiMarco was a table guy. As I sit down to talk to him, DiMarco folds his newspaper and extends his hand. He's in his fourth year with the Falcons, and has the quintessential table-guy job. He's a fullback. That's the player who lines up in the backfield between the quarterback and running back. "Just go out there and clear holes," he says, describing his duties. "Clear holes, pass-protect and when your number is called, make a play, catch the ball, make somebody miss. Drop your shoulder and bring that physical presence to the game." When you see a running back electrify a crowd with a touchdown run, it's sometimes a fullback who made the block that helped send the running back on his way. The cheers are for the player who scored. That's OK with DiMarco. "Our success is due to the success of the guys behind us," he says. "So having guys like [Falcons running backs] Devonta [Freeman] and Tevin [Coleman] behind us, you know they make us look good." DiMarco and his fellow fullbacks are cut from the same cloth as offensive linemen — players satisfied with doing the grunt work. DiMarco says it creates a camaraderie around the league. The cheers they might not get from the crowd? They give to each other. "I think there are only 24, 25 fullbacks in the NFL [out of 32 teams], he says. "After games, we seek out each other and say 'Hey dude, so happy to see you. Good luck the rest of the year. You've been playing awesome.' "
As the Super Bowl approached, DiMarco says the images in his head weren't of confetti fluttering down from the stadium rafters or hoisting the Lombardi Trophy. They were of the work ahead, the process he hopes will lead to the trophy. They were, typically, images of himself clearing paths to victory. When Patrick DiMarco goes to work Sunday at Houston's NRG Stadium, Kimberly Archie will be in the stands watching. And cheering. And trying to forget how the sport left a hole in her life. Archie's son, Paul Bright, died in 2014 at the age of 24. He was in a motorcycle accident. But Kimberly Archie says her son died from football. Paul started playing as a 7-year-old in Pop Warner — youth football — and he played into his freshman year in high school. After he died, his mother was suspicious about his erratic behavior leading up to the accident. She'd become knowledgable about football-related brain injury after working with plaintiffs in a massive lawsuit that was recently settled between retired NFL players and the league. Archie asked researchers at Boston University to study her son's brain. It showed he had Chronic Traumatic Encephalopathy, or CTE, the brain disease depicted in the film Concussion. The discovery led Archie to co-file a lawsuit last year against Pop Warner. Archie was at a Super Bowl party Saturday hosted by legendary sports agent Leigh Steinberg. It was his 30th annual Super Bowl bash — and like almost all of the previous occasions, the drinks and finger food were mixed with social consciousness. An hour before the party's scheduled start time, there was a panel discussion on brain trauma in football and the military. Steinberg first advocated for concussion awareness back in the 1980s, long before the issue became front-page news. At the party, he talked about the "crisis of confidence" he had, signing young men to play a game that had the potential to damage their brains. He reconciled his feelings by pushing for more knowledge about the subject. Kimberly Archie was not on the panel, but she spoke afterwards about her son. "He played eight years of Pop Warner," she said, "and only one year of high school. In fact, he only played three plays in one high school game. It was a real eye-opener. You don't have to have a concussion, you don't have to play in high school, college or the NFL, to be exposed to long-term brain damage that can kill you." The Pop Warner youth football organization has taken steps in recent years to limit contact in practice and outlawed particularly dangerous blocking and tackling drills. Archie said that beyond the lawsuit, her efforts to improve youth sports safety are gaining momentum. She said they're being fueled by mothers who've had similar experiences. "There's nothing like a mom who's buried her child," she said. "You're not going to shut them up. You can threaten them, whatever. It's not going to matter." As she spoke, at the party, giant video screens in another room showed heroic, slow motion footage of the Falcons and Patriots. Archie pointed to one of the screens. "I promised my son I'd take him to a Super Bowl," she said, "which I never got the chance to do. So [my daughter and I] are going now. We're going to go to the game and be a part of the experience and try to look beyond the brain damage. ... It's a love/hate thing."